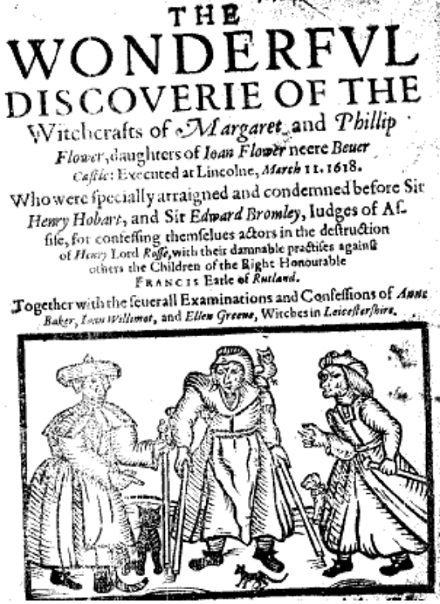 The family of the Earl of Rutland enjoyed closure on this date in 1619* when two daughters of a notorious local sorceress were hanged at Lincoln Castle for bewitching the Rutland heirs to death. Hotheaded enough in his youth to have joined Robert Devereux‘s ridiculous rebellion, Francis Manners had matured into a solid pillar of James I’s court by 1612 when he succeeded to the Earldom upon the passing of his brother. Taking up his proper residence at the estate’s noble Belvoir Castle, lord and lady Manners had two noble sons and the consequent prospect of a robust progeniture to carry on the Rutland title, father to manful son onward into trackless posterity. But witchery (as Shakespeare documented) went boldly abroad in those days. To the Rutlands’ grief it set its fell eye against the prosperity of their house. Someone having detected this clan of hags pilfering from His Lordship, the Flower family was soon dismissed: a reckless show of rectitude by parents who would soon have cause to regret it. Joan Flower, the mother, “was a monstrous malicious woman, full of oathes, curses, and imprecations irreligious … her eyes were fiery and hollow, her speech fell and envious, her demeanour strange and exotic.” Folk who knew her had come to understand — how could they not? — that her curses had the power to bend infernal servants to her spiteful will; her daughters were likewise suspected of necromantic potency all their own. Together, they were formidable enemies when roused — and they promptly avenged their dismissal by enchanting the Rutland heir Henry, who fell ill and died in September 1613. (The rest of his family got sick on this occasion, too.) Five years later, they enspelled Henry’s younger brother Francis and sent him to an early grave too. Under such compelling affliction, the family could not long remain ignorant of the Flowers sorceresses’ enmity, and denounced them to authorities. They were arrested around Christmas of 1618.
called for Bread and Butter, and wished it might never goe through her if she were guilty of that whereupon shee was examined; so mumbling it in her mouth, never spake more wordes after that, but fell downe and dyed as shee was carryed to Lincolne Gaole, with a horrible excruciation of soule and body. “Two sons, both which dyed in their infancy by wicked practise & sorcerye”: Inscription on a Manners family memorial at Bottesford. (cc) image by J. Hannan-Briggs. * 1618 by the local reckoning, since the new year at this time began on March 25. It’s 1619 as we would see it retrospectively in view of a January 1 calendar rollover. † Some scurrilous wags of the present day have suggested that said favorite cunningly poisoned off the brothers himself so that he could get his hands on Katherine’s huge tracts of land.